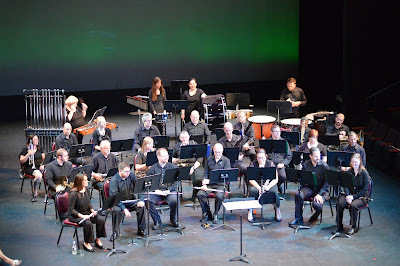 Axel Perez Blog: Central Florida Sounds of Freedom Band and Color Guard, conformado por miembros de la comunidad LGBT de la Ciudad de Orlando nos hace una agradable e importante invitación. Central Florida Sounds of Freedom Band and Color Guard, conformado por miembros de la comunidad LGBT de la Ciudad de Orlando nos hace una agradable e importante invitación. Que tal amables lectores, como de costumbre les comparto información importante y en esta ocación para los residentes de la Florida Central les tengo una excelente invitación la cual les comparto a continuación. Central Florida Sounds of Freedom Band and Color Guard, Orlando's own LGBT marching and concert band, is pleased to announce our first concert since playing our 5th anniversary show on the day of the Pulse shooting. We know this holiday season will be bittersweet for so many who are celebrating their first Christmas since that tragic event. We hope to bring the healing power of music to our community once again as we did in the days and weeks immediately after the shooting. 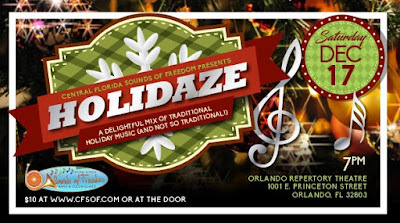 Central Florida Sounds of Freedom Band and Color Guard, Orlando’s own LGBT+ concert and marching band, presents our winter concert “Holidaze” on December 17th at 7 pm at the Orlando Repertory Theatre (1001 East Princeton Street, Orlando 32803). This show features beloved holiday music from Halloween to New Years Eve, plus a sparkling silent auction. Tickets are $10; available at the door or online at www.CFSOF.com. Kids 12 and under are FREE! Let the spirit of the holidays move you to join us for this one of a kind event, as we play joyous holiday tunes to uplift your spirit. Don we now our gay apparel to CELEBRATE the season!